Well, wow. What a wonderful weekend. 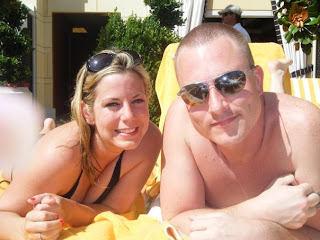 Vegas was so much fun and it was exactly what the doctor ordered. 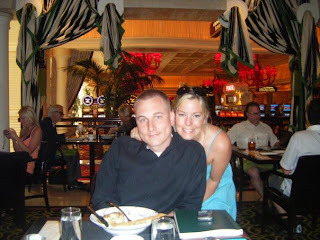 We stayed at the Wynn Encore and it was a gorgeous hotel. Our room was beautiful. We actually made it around to almost the entire strip and saw a show and ate delicious meals and got lots of desert sun. We had a blast. 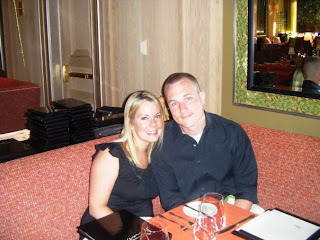 What is funny is our favorite part of the trip was hanging out at the Harrahs Carnival Court! They have the best "flair" bartenders in the world, the alcohol flows freely and CHEAPLY, the music is rocking and the crowd us fun! No one won big (in fact poor Thomas couldnt win to save his life)... but we cant wait to go back in September and stayed far within our budget (not an easy feat in VEgas). My girls did great and had an awesome time at their Nana Pops house! Although I am sure they were ready for a break after 4 days, they took it on like superstars and the kids loved being there! Now back to reality and ready to start the summer! Swimming on the agenda for this coming LONG weekend! Why do you have water on your face?